Ryder is a home-bred boy, raised in our nursery out of two lovely champion parents, Am/Can CH Naja's Enterprise of Summer, SOMC, SOM, CD, AGN and CH REO's MIss Hershey's Kiss CGC CA. This combination brought the best of both parents together including a wide, straight bite, correct wrinkling, a deep chest and substance. His soulful expression melts hearts with his double dark haws and deep brown eyes. 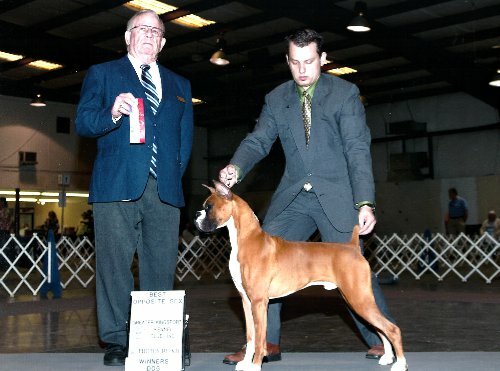 Ryder's sire, "Mr. Spock", was awarded the coveted American Boxer Club Sire of Merit title with eight American and nine Canadian Champion kids. His dam, "Ginger", has produced two AKC Champion offspring from Scotty's litter already and has a number of puppies either already titled or showing in conformation and performance or working towards those goals, along with a BIS winning S. African Champion and an Int'l Champion. Bred to produce, Ryder's sweet temperament is passing along in his puppies.